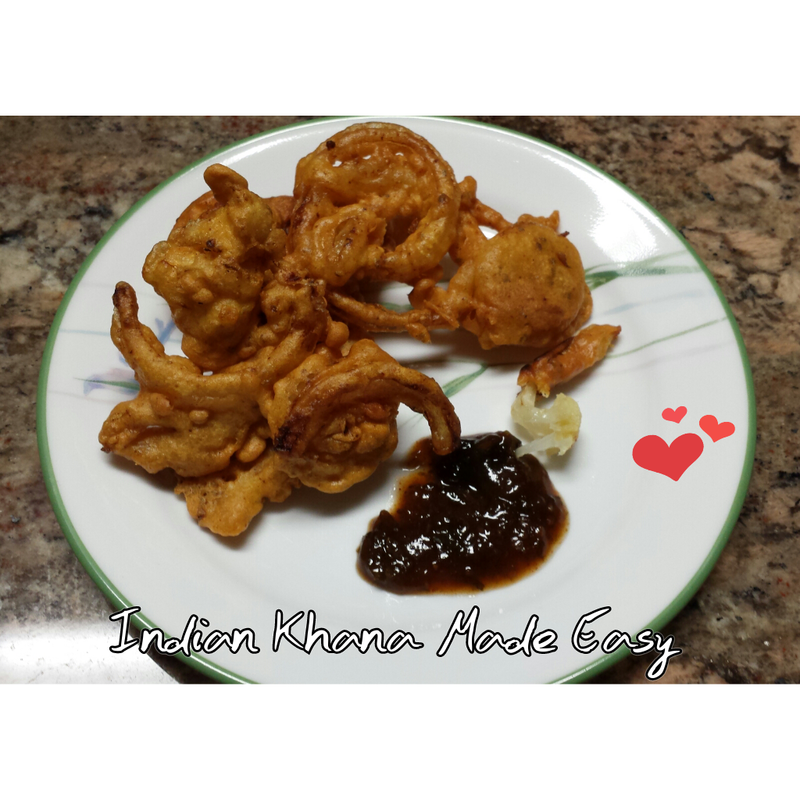 Indian Khana, Made Easy: Cauliflower and Onion Pakora - A Hot Appetizer for Cold, Snowy Nights! Cauliflower and Onion Pakora - A Hot Appetizer for Cold, Snowy Nights! nothing warms the heart like hot and spicy vegetable pakora made with chopped cauliflower and sliced onions. I forgot to mention that this is also his specialty. My dad usually cooks on a whim and doesn't follow recipes so below is a brief synopsis of the ingredients he used and how he made the appetizer. I will somehow drag the recipe out of him and share with you. Here you see him frying the vegetables, making sure they fry evenly. You should take them out when they are golden in color. It's a good idea, to take one out and cut it with a knife to see if the vegetable cooked well. He scooped out the golden pakora with a metal spatula and transferred them into a meshed colander that was placed on a plate covered with paper towel (the towel helps to soak up the oil). Once the oil was soaked up, we ate the hot pakora with sweet tamarind chutney, shown above. The onion pakora were the best. And don't worry, you haven't seen the last of my dad's cooking either. He'll be back soon. He makes a mean cauliflower curry that brings everyone to the table. If you liked this recipe, you are sure to enjoy some of our other fritter and popper recipes, such as Chili Poppers,Veggie Pops, Masala Bread Pakora, Onion Drop Fritters and/or Picante Peanut Poppers.